This material is unusual in its construction – as our permanent readers might already know, this means we are going to place high emphasis on the product due to its specifications. This article consists of several parts and your attention should be draw firstly to the one describing the camera, since its characteristics are a major breakthrough to date. The decision of merging two reviews into one was dictated by almost complete identity of the handsets. Forming of Sony Ericsson product line has been followed by many hardships lately – absence of a wide line-up and availability of only a few best-seller models saving the sales haven’t let the company lose initiative. Having acquired taste for “ultimate”-solutions in certain fields, Sony Ericsson left out product line variety and until 2005 hadn’t released any modifications of its devices. Launch of Walkman series, featuring minimal differences from Sony Ericsson K750i, was an experiment, though very ambitious. – in the end it turned out to be a success and the company decided not to shut down twin handsets projects for some of the upcoming devices. In all respects average sales of original models of the new series, like Sony Ericsson W550i, were a powerful incentive to focusing on those, alternative solutions. But to tell the truth, W550i had materialized as a result of increasing S600 functionality, which in its turn was dropped out later on. The entire idea of twin projects in many respects was borrowed from the successful attempt of forwarding Series 40 by Nokia, when some solutions saved the sales of models with average functionality. And here the factor of users getting used to a certain quality of functions’ realization steps in, as brand loyalty begins to shape. That’s why popularity of Sony Ericsson K750i made it possible for W800i to become a hit and raise overall sales of this platform. At the same time, it was essential for Sony Ericsson to balance between amount of new and twin models, in order not to turn into a company, manufacturing devices of the same kind, but with various indexes. At this point in time, this issue is being solved by an exclusive know-how – introduction of different trade marks, handed down from Sony. In fact every single brand brings a device out of the product line and creates a new line-up. Actually this is becoming a world-wide tendency in the field of mobile phones – remember Eseries, Nseries by Nokia, or four-lettered indexes of handsets by Motorola and corresponding product lines, based on them. The most outstanding Motorola’s representative of this tendency is RAZR line-up. However BenQ Mobile can’t keep up with this, as after the recent reorganization even its employees are afraid of entangling in countless abbreviations. In the end of 2006 the Korean manufacturers are going to release separate line-ups and position them in a different manner as well. Those, who managed to claim the title of pioneers in this sphere, will earn a small fortune on this in the future. In case of Sony Ericsson, the first stage featured the popular in the past brand of Walkman – with the help of several new devices the company managed to get its recognizability even higher. The next logical step appeared in the form of a respond to Nokia’s attempt to position a number of its devices as purely photographic ones – as a matter a fact, this threatened Sony Ericsson K750i sales, which had already proved to be a solution aimed at portable shooting with the best picture quality among all mass handsets. The first product of this kind by Nokia featured glass optics, picture quality, comparable with Sony Ericsson K750i and co-branding with Carl Zeiss. The synergetic effect caused by Nokia and Carl Zeiss brands tying up was so enormous, that there were some serious debates between our readers. As to me, everything turned on marketing, since specifications of these two handsets were evenly matched. The product by Sony Ericsson and its following variations couldn’t boast of famous brands – their main advantage was the best combination of price and quality. 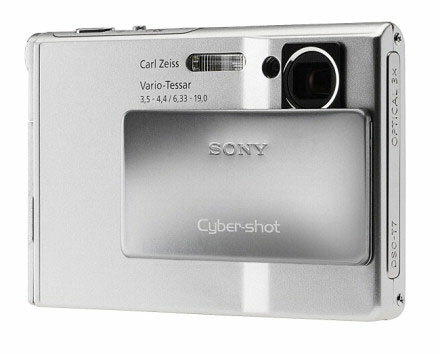 Thus in order to secure itself against attempts of other manufacturers to achieve advantage via synergetic effects in the future, Sony Ericsson reached an agreement on incorporating CyberShot technologies into its products. In fact, it had been used by Sony since 1996 and actively promoted along with digital cameras – the raising popularity of which increased recognizability of this trade mark. In the end of November 2005, the brand of CyberShot placed third in Landor agency’s all-round rating, which featured brands from all fields (the first place was given to Google and LeapFrog was the runner-up). The widely known iPOD managed to hit only the 8 place. I, by no means, agree or disagree with the results of this research, though I have to mention that this trade mark is very popular. By using this trade mark in its products, Sony Ericsson will increase brand loyalty, and that’s exactly what the company needs. And if they can support usage of this brand with outstanding specifications of the upcoming model, the synergetic effect will be heavy. Acting in advance I would like to note, that the process of merging with Sony’s brands will continue in the near future – moreover it seems that PlayStation is next in turn, as vertical integration of PlayStation3, PSP and several new models by Sony Ericsson is already scheduled. When I was writing this article, I came across a very interesting material on CyberShot brand advent, and now I call your attention to it. One of the essential conditions of successful model is mimicry with known products of different brands. 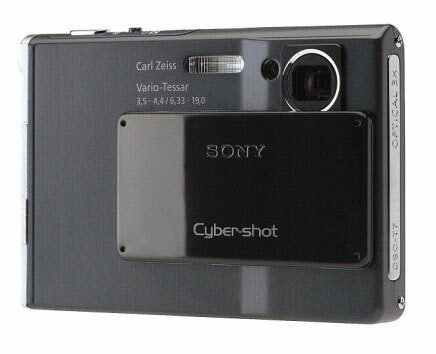 When Sony Ericsson signed up CyberShot trade mark, the back panel of the handset was remade as much as possible in order to fit the camera. The shutter, the flash and other parts are so similar to the “slim” line-up of digital cameras by Sony that one can marvel upon. From describing stories of various brands and reasons of their materialization in the models of Sony Ericsson line-up, let’s get straight down to a question not less interesting. Why are we reviewing two models at once? In order to answer this question, let’s remember what the major complaints of Sony Ericsson users were in the year of 2005 and today. For many the sticking point was absence of EDGE in the device – this technology is gathering pace nowadays, however according to a research its relevance during the last year was dubious. Nevertheless the consumers have begun proceeding from this parameter as well when choosing a handset – that’s why it has to be taken into account as well. For potential buyers the company released Sony Ericsson W810i, therefore should you need EDGE and a number of upgrades – pick this solution. But there is the other category of people who are not desperate for EDGE, but want all functions of K750i to materialize in a model aimed at UMTS-networks. The attempt to gather all these requirements in one product led to rise in its price and dependence on supplies of chipsets with incorporated EGDE, though over the last year the market suffered from deficiency of these (the same Motorola will apply EDGE to mass handsets only starting from the latter half of this year, even though all devices were introduced with this technology onboard in the first place). It was unacceptably for the company, thus we didn’t see the release of an updated K750i version after all, although it could appear on the shelves (with EDGE support and improved camera’s module). On the new developmental stage, the company took a decision to use two hardware platforms at a time - B200 and D400. The former one is aimed at UMTS networks and adopts a frontal camera, while the latter one operates in common GSM-bands, doesn’t have a frontal camera and features EDGE. Wilma (later on received K800 index) represents senior devices, and Evita, in its turn, is a junior model K790. The difference in titles should have resulted in price distinction, but the company fairly considered that these two handsets are aimed at a bit different audiences and evened up price on two devices. This is a rather daring experiment, and from my point of view it’s more likely to be a success, because the models are equal in terms of interface and technical characteristics. These devices were expected to be introduced into the market a bit later and a number of specifications would differ from the current state of things: in particular they had anticipated a renovated interface featured in both models. However nothing of this did happen, since the manufacturer decided not to let Nokia 6233 rule the forming market of business-handsets. But at the same time the number of innovative technologies in these two models is enough to consider them as top models of the line-up. All mistakes regarding shipments of Sony Ericsson K750i were considered and concluded, therefore a Chinese plant prepared large consignments of both models and once they are officially released, no one will experience lack of these handsets. This will let avoid deficiency and in a short period of time reach the recommended prices, set on majority of markets. In the next part we’re going to reveal the design of the devices, constructional peculiarities and displays.